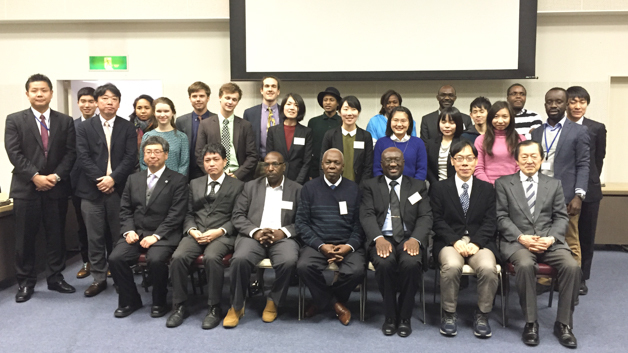 On 16-18 February 2016, UNU-IAS hosted a symposium titled Towards a Strengthened Academic Partnership between Africa and Japan for Sustainable Development, in association with the Japan–Africa Academic Network (JAAN). The joint symposium addressed challenges and lessons learned from intellectual exchange between African and Japanese universities, through initiatives such as the UNU-IAS Global Leadership Training Programme (GLTP). The speakers, who included prominent guests from GLTP host universities, academics from Japan and Africa and alumni, discussed the unique experiences of these exchange programmes, JAAN’s new partnership initiative, the role of knowledge exchange in achieving sustainable development, and ways for building and enhancing international collaboration in academic fields. Following the symposium, UNU-IAS invited GLTP stakeholders, including the Ministry of Education, Culture, Sports, Science and Technology of Japan (MEXT) and the head coordinator of JAAN, to take part in a GLTP Feedback Meeting. The participants examined feedback on GLTP and discussed further improvements to the programme. Presentations by researchers who had participated in GLTP in Ghana, Senegal, South Africa and Zambia were followed by a workshop addressing GLTP’s contribution to building the skills of participating students, its contributions to host communities and universities in Africa, and ways of enhancing existing networks. The discussions revealed that the programme positively contributed to developing the capacity of Japanese students, as well as academia in Africa. Experts called for strengthened communication between the African and Japanese academic supervisors and expanded opportunities for co-publishing and dissemination of collaborative work, in order to further enhance GLTP’s impact and promote Africa–Japan academic partnerships. The final day of the event included an excursion to the Macromolecular Chemistry and Physics laboratories of Tokyo University of Agriculture and Technology — the workplace of one of current GLTP researchers. The visitors received a presentation on research in the field of environmental pollution monitoring and explored opportunities for closer collaboration between African and Japanese supervisors. GLTP, which has been implemented by UNU-IAS since 2013, is a training scheme sponsored by the Ministry of Education, Culture, Sports, Science and Technology of Japan (MEXT), and designed to provide Japanese postgraduate students with opportunities to conduct their field trips in Africa and work closely with supervisors of local universities. Until present, 25 students have received financial and technical support from GLTP and completed their research in eight countries: Democratic Republic of Congo, Ghana, Kenya, Malawi, Senegal, South Africa, Uganda and Zambia.